From 2014 to mid-2015, investors seemed to have a favorable view on stocks if one bases the observation on ETF and mutual fund flows. 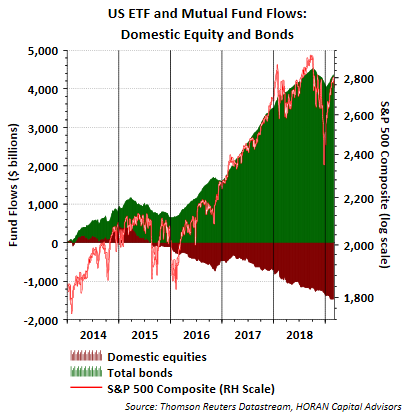 As the below chart shows, the increase in S&P 500 Index until mid-2015 coincided with positive flows into domestic equity focused mutual funds and ETF's. Beginning in mid-2015 though, investor flows turned negative (maroon line.) 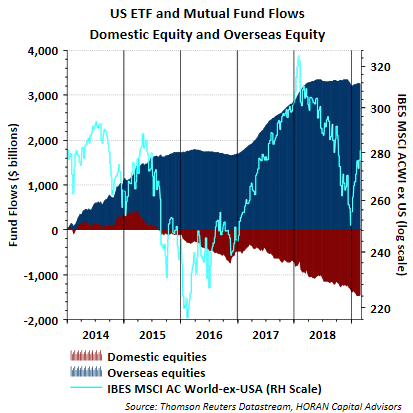 During late 2016 and early 2017 the cumulative maroon line became less negative indicating positive flows into domestic equities, but the sharp rally from 2017 to the market's peak at the end of the third quarter of 2018 was not supported by positive domestic equity flows. In fact, domestic equity flows have been negative to the tune of -$1.5 trillion over this five plus year period. In lieu of U.S. or domestic equity flows, investors favored overseas or international investments as seen with the blue shading below. For 2017, the positive flows into foreign equities coincided with strong international returns. In fact, in 2017 both emerging markets and developed international equities outperformed the S&P 500 Index. International returns reversed in 2018 and underperformed domestic equities. 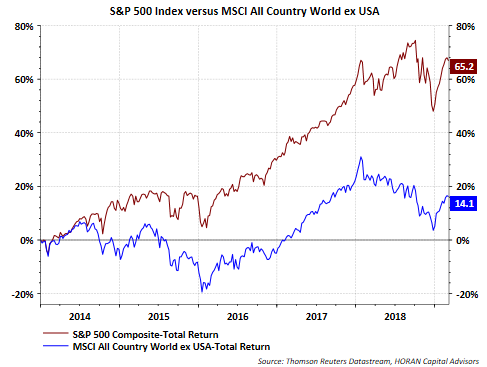 Over the five-plus-year time frame that begins in 2014, the MSCI ACWI ex USA index total return was 14.1% while the S&P 500 Composite was up about 65.2% on a total return basis. As seen in the first chart in this post, cumulative bond flows have remained positive in spite of their lower returns. Recent flow data for this year continues to indicate investors have a propensity to allocate investments to bonds. 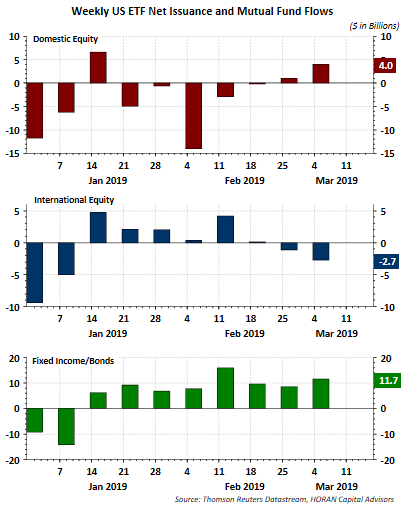 Also, the last two weekly flow reports from ICI show domestic equity flows have turned positive.